There’s a saying that no one on their deathbed ever wished they spent more time at the office. We agree. We also believe dedicating yourself to a business you believe in, a business that will provide for you and make an impact, is incredibly fulfilling. However the time and energy required to build your own business can come at the expense of the very things that life is about—like family and friends, health, pursuing your curiosities, and more. From our experience, business plans focus on things like products and services, competitive advantages, and market analysis; ignoring the impact the business has on the personal lives of owners or employees. In other words, business plans prioritize business goals over lifestyle goals. But when building your own business, why not prioritize your lifestyle goals instead? Rather than having business goals and decisions define our companies, our lifestyle goals and decisions can define our businesses. AKIBA: I originally started Freaklabs because I wanted to go my own independent way. Freaklabs originally specialized in embedded wireless technologies, which was quite successful around 2007. It started out as a traditional technology business with the main purpose of maximizing profit. At the time, I didn’t have greater goals or motives other than financial independence. I put together a rough business plan describing what I would be designing, how I would grow the company, and the millions I’d be making within a specific time frame. In my naiveté, there were many things I didn’t consider. I painted my target audience as broadly as possible. Phrases like “I only need to reach 0.1 percent of the market to hit millions of dollars in revenue” rang in my head. The fatal flaw with this approach is when you design something for everyone, nobody wants it. At the time, I believed I was two years away from reaching a million dollars in revenue. With this mindset, spending money on small things seemed insignificant. Most of all, I ignored many personal issues that would ultimately affect the business. One of the biggest mistakes I made in my business plan was neglecting to have a greater goal that I strongly believed in. Viewing a business simply as a revenue generator gets old quickly. When the hard times come, without a passionate belief in what you’re doing, it’s easy to fall into personal crises such as depression or despair. Needless to say, due to incorrect assumptions about my target audience size and uptake, as well as numerous rookie mistakes, like not properly managing inventory levels, within a few years, the business was in trouble and I was under tremendous financial strain. This only added to the amount of strain on my marriage at the time, which eventually fell apart. After my divorce, it took me years of reflection, experimentation, and picking up the pieces of my life, before I could start designing again. The big lesson for me was that business plans shouldn’t simply be a cold, calculated financial statement. While many people start with a lot of energy and work long hours, fewer plan how to motivate themselves when depressed, uninspired, and juggling bills. Upon starting a business, you experience emotional highs and lows for months to years as you try to stabilize things. Much like a marathon, the inner game of maintaining hope, motivation, and confidence becomes excruciatingly important. My current approach has a much stronger emphasis on my personal beliefs such as the importance of environmental monitoring, having clear, measurable goals, and de-emphasizing profit as a key metric in exchange for things like lifestyle, travel, and family. My business is now an expression of my beliefs, opinions, and values. JACINTA: I hesitated a very long time before starting my own business, mainly because I believed the goal of a business was to make money and grow as large as it could, and I didn’t want to spend my life working toward this. In the business world, the metrics for success are viewed in economic terms, like profit, growth, market value, and so on. Working toward such goals doesn’t fit into the kind of life I want. I want a life where I have the time, focus, and energy to spend with loved ones; to pursue my curiosity; to learn and develop new skills; and to work on non-business related projects that are important to me like growing food, collating soil and temperature data,and experimenting with agricultural technology. I want to travel and experience as much of the world as I can; to eat well, sleep enough, exercise, and enjoy downtime and the simple, fulfilling, everyday things. Throughout my career I’ve looked for jobs or work that would align with these goals. I’ve worked for startups, government, multinational corporations, small businesses, social enterprises, and as a freelancer. I’ve tested myself in different roles and brands, and rarely took a position where I didn’t believe in the “higher something” the organization or brand was trying to achieve. At each organization, I found a distinction between work and personal life that collided with how I wanted to live my life. Business was always encouraged to take precedence over personal lives, and balancing the two was the responsibility of the individual. The closest I came to incorporating my life goals and principles was when I worked with a social enterprise. The social enterprise was an online and offline publication that showcased the stories of people who had a vision to make their world a better place, and were courageous, for various reasons, in pursuing that vision. It ran according to principles I believed in, allowed me to work remotely, learn and explore topics I am interested in, and meet inspiring people. As I was an Associate Partner, I also had the autonomy to make decisions. However, it was a constant struggle to keep it afloat financially, and I needed to supplement it with other income. It seemed business would always clash with the way I wanted to live my life. After the social enterprise closed, I had time and resources to put toward projects that I wanted to do. As I was experienced in creating content, I decided to write a “choose your own adventure” style picture book for my nieces. After the book was ready, the reactions it received made me realize there is an audience and gap in the market for the type of content I enjoy creating. This was the beginning of Zoot Publishing. I also began to realize that by being the decision maker in all aspects of the business, I could craft a business that fit best to my other interests. Zoot Publishing is still in its infancy, but I already have a clearer vision for how it fits into my life better than any business or position I took in the past. Having to make so many decisions made me realize the incredible freedom, and responsibility, of running a business. One of the most valuable things I learned is each business decision I make, not only defines the business, but also contains a set of values and priorities that defines me as a person, and the kind of life I’m creating for myself. I realize my business can enable a life that would make me content, and be a vehicle through which I could both create and contribute something meaningful to the world in my own way. For me, meaning comes from leaving things in a better state than the state I find them. I push toward this by utilizing more responsible printing practices or creating diverse characters that are more inclusive and representative. 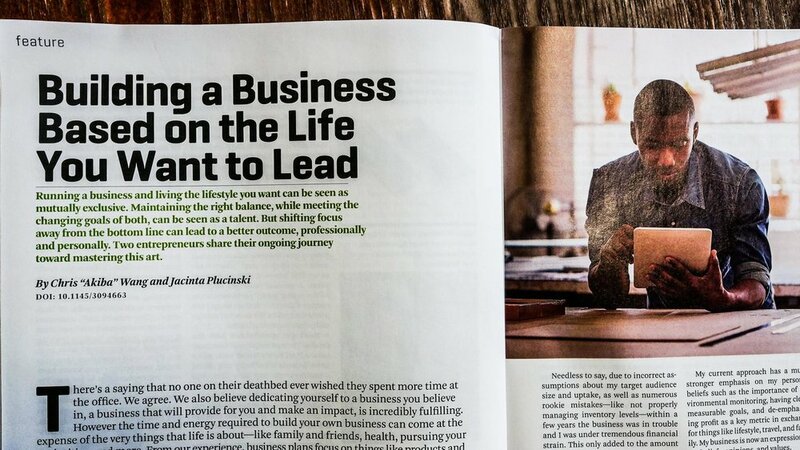 With a meaningful business and life, comes an intrinsic sense of “heading in the right direction.” When my work aligns with what I want from life overall, I have the stamina to stick with the business in the long run. It doesn’t always fit neatly and contradictions still exist such as working long hours even when I need more sleep and rest. However there is a peace of mind from knowing the goals are life goals, not business goals. AKIBA: Finance is probably one of the most important aspects of a lifestyle plan. Many people give up on their ideal lifestyle because they don’t believe they can afford it. There’s no magic wand for dealing with finances. Typically lifestyle businesses wouldn’t qualify for venture investments so finance is handled the good old fashioned way: reducing expenses and increasing revenue. Revenue is important no matter what type of business you run, but reducing expenses is equally important. I always look at the ratio of my fixed costs to my revenue. A healthy ratio is to have fixed costs (rent, bills, and regular monthly expenses) at around 20-30 percent of income. At 20 percent, there’s money for growth as well as money to save while still covering costs. Around 30 percent still allows you to spend for growth, but there won’t be much to save. At 40 percent, you’re pretty much covering costs. Beyond that is pretty much the equivalent of living paycheck-to-paycheck, or even having a negative net income. These ratios will differ based on spending habits, tax brackets, cost of living, and other factors so you will need to tailor them for your own situation. In my case, I made the conscious decision years ago to live in the countryside and maintain a sustainable lifestyle, both financially and environmentally. There were many extra costs associated with living in an urban setting such as higher rents, going out more, maintaining appearances, transportation, etc. Renting a farm and living in the countryside allowed me and my girlfriend to cut costs drastically and maintain a higher quality of life surrounded by nature in a stress-free environment. Rent was the highest expense while living in the city so moving to the countryside was the equivalent of receiving a few thousand dollars every month. JACINTA: I knew my business would be closely integrated with my life, and so I wanted my business to be something that would bring my boyfriend and I closer. We support each other’s product development and run workshops together. This gives us more time together and a better understanding of what’s important to each other. Not only does Zoot Publishing create books and games, we also conduct workshops on the power of choice, storytelling with paper and electronics, writing, publishing, and printing. In our product development, we express our values through both the story content and the production. For example, our stories are mysteries that encourage curiosity and observation, with diverse characters and proactive heroines. Agency is also expressed in the “choose your own adventure” format, which gives the reader responsibility for the story. I’m concerned about our environment and my goal is to minimize my personal and professional impact on it. When we develop products, it’s with a full lifecycle in mind. What happens to the books once they’re read? Where do they go? We reduce the number of print runs and the waste created by having excess stock. We also encourage readers to pass on the books after they’re finished with them by encouraging them to write a message in the book to the next reader. We ask the readers to donate the book to their local library. We also raise awareness of the value of libraries in general through social media. This production development cycle is still a work in progress, but we believe that small steps make a difference. AKIBA: I once mocked marketing as a skill that requires no skill. That couldn’t be further from the truth. I’ve come a long way in understanding where marketing fits in my business. It’s probably the most important aspect of business, but nobody ever told me how it could be done ethically, morally, and as a form of self-expression. I grew up thinking marketing was the art of selling people things they didn’t want. Terms like direct marketing, telemarketing, network marketing, or internet marketing didn’t matter to me. For me, they were just code words for scam-like businesses. Marketing now permeates my business in many areas, but it’s done in a way that is meaningful to me. In contrast to how I originally started FreakLabs, the rebirth of Freaklabs required a lot of reflection on what was meaningful to me. I discovered I really care about two things: the environment and arts. With that as my guide, I decided to separate my products and design efforts into two separate product lines. The Freaklabs line focuses on equipment and hardware for outdoor environmental monitoring and research; and the re-branded Illuminado product line focuses on theater technology for performers. My interests influenced my marketing decisions, and those decisions influenced the business structure. By separating the products into two separate product lines with narrower audiences, it allows me to focus my marketing efforts to specific audiences relevant to each line. It also allows me to target my designs and features to needs my audience might have. Most importantly, I’m very passionate about those two areas because I believe they make a difference in the world. One of the interesting implications of this way of thinking is the realization that I don’t need to cater to all customers. I no longer feel the need to push myself to appeal to the broadest possible audience and come up with generic designs. By focusing on a more specific audience, I allow myself to make bolder decisions in my designs. I’ve added features that allowed my ideal customers, i.e., people interested in environmental monitoring, to instantly recognize it was targeted at them. Interestingly enough, sales increased without me increasing my marketing effort. I started getting much more business via word-of-mouth sales and returning customers. My view about marketing has also changed my view of travel. Rather than traveling to trade shows or events, my girlfriend and I now plan our travel to places that have meaning to us. As family is a big part of our lives, we try to create markets for both our products wherever we have family. This consists of community outreach, workshops, in-person appearances, and finding local distributors in those areas. We tailor our marketing to address local needs and express dedication to each area in a unique way. Some examples are running local workshops in areas near hackerspaces, makerspaces, and community centers, as well as giving talks to local communities, schools, and clubs. The benefit of doing things this way is that we can build our businesses, and spend more time with our families and strengthen family bonds. JACINTA: My boyfriend and I both work in manufacturing. As manufacturers we’re part of an industrial machine that uses natural resources. If we claim we care about the environment, we need to be responsible for the manufacturing impact of our companies, and to trace and verify the supply chain as much as possible. This takes time, costs money, and language barriers complicate things further. Paying more for paper that is Forest Stewardship Council (FSC) certificated, researching and asking what kind of ink is being used, and doing factory visits to build relationships and see the work conditions and environmental standards of the factories are ways we do this. Fulfilment and logistics have a big impact on our lifestyle goals, as currently these tie us geographically. Our inventory and prototyping setup is in Japan; when we travel, it essentially stops. The next step in our lifestyle plan is to automate our fulfillment and build a mobile prototyping setup that can travel with us. The approach of aligning a business with a lifestyle plan is an incremental process and can’t be done all at once. It needs to constantly adapt as priorities, values and the business landscape changes. But it can be a reference and guide to living a fulfilling life, and running a fulfilling business. Posted on November 7, 2017 by Jacinta. Mar 11, 2017 New workshop series starts on Thursday! Jan 24, 2017 We're talking Interactive Fiction - why readers and writers love it! Nov 18, 2016 Indiegogo launch campaign is a success! Nov 11, 2016 We did it! A COLOSSAL thank you to all the backers! Oct 26, 2016 35% of our campaign goal in one week! Oct 19, 2016 Who Ate The Cake? launch campaign on Indiegogo is live!